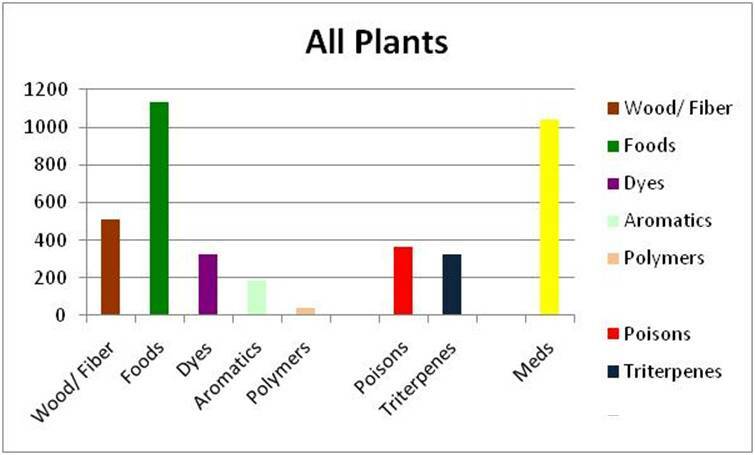 Recall the previous pie chart for major ethnobotanic chemical classes for All Plants. The following is a demonstration of how these major chemicals are distributed across the very large taxonomic grouping of plants. Chemically speaking, the simplest of plants are non-toxic, and their major uses are related to foodways. With the development of vessels in plants we see some chemical differentiation also occurring, enabling some taxa groups to provide medicinal values. It is important to note however that the numbers of species at this level is exceptionally low. These archaic species are remnants from a period well before human existence, and probably evolved in direct association with other animals, including anything from invertebrates to insecta. It is expected that in the past, these major groupings of plant would have developed some natural defense mechanisms against their predators, engaging in everything from simple passive defense mechanisms related to structure and impalatability, to more sophisticated methods utilizing amino acid transformation paths to produce selectively toxic agents, for example, the Equisetopsida produce nicotine, although not really in any highly toxic amount for the remaining species. This suggests it is possible for a relative to have nicotine in significant amounts in some fossil specimens could such a composition be testable (due to the organic nature of most plant chemicals like this, they are possibly long gone by now). When we move up the larger groupings [Ginkgo, Ephedra, etc. ], we find very distinct chemical synthesis pathways now well-developed. The toxicity of Ephedra is due to a simple alkamine production path (ephedrine). The ginkgo is fairly complex in its chemistry, suggesting that a number of paths are now very well evolved. Cycads took a more novel approach,, modifying their amino acids to produce toxins, which they can use as a protectant of their edible starch-rich inner trunk. Pinopsida is well separated from the other three gymnosperms just mentioned. This broader class of trees demonstrate even more evidence for significant chemical modification. All lignose groups demonstrate the ability of plants to synthesize the polymer lignin for survival purposes. These groups began with some of the larger groups now extinct close to Lycopidopsida, continued with the Filicopsida, and Gnetum, Ephedra, Wyethia, Ginkgo and Cycads, but now has a fairly pronounced effect on species survival involving the Pinopsida. The Pinopsida also perfected a non-oxygen-bearing terpenoid pathway, producing its various resins in this fashion; although most of the terpenes we talk about regarding this path are monoterpenes, sequiterpenes, and diterpenes, there are a number of much larger terpenoids with the non-oxygen character in these plants. The more of these compounds there are in the entire mass of products, the more resinous and less aromatic and evaporative the species products become. The seed oil concept has just begin to evolve in the naked seeds of Pinidae. Whereas Gingkopsidae produce an antifeedant with a prohibitive nitrogenous alkaline like smell (like old half-dried beer vomit on a day old towel), the aromatic compounds produced by it terpenoid paths are the way this plant acheives the same result. The more advanced Pinopsida members produce alkaloids, in particular Taxus, but also Pinus, which uses a shunt pathway to rapidly produce an alkaloid or better stated alkaloidal amine. Taxus is well advanced in that it also produced the fairly complex polycyclic compond taxol. This is a heterocyclic compound, meaning that it evolved through a unique path other than the simple recurring pathways many of the terpenoids tended to follow. Other important chemical evolution features in this family include the development of the lignan epipodophyllotoxin and several other complex cyclic anticancer compounds by Calocedrus and other Pinales members. The next level of large group chemical evolution is demonstrated by the chemical features distribution of the Monocots and Dicots. Chemical complexity is now the end product in a plant’s life. Whereas the earliest species of plants lacked much of the toxicity seen with later plants, the evolution of chemical pathways in the Angiospermae results in numerous much more complex synthesis pathways. As one ascends the evolutionary level in the Angiosperms, we see not only increased chemical complexity, but also a merging of complex chemical pathways. This merging of synthesis paths is the next major step a plant must take in chemical evolution to continue to maintain its stability in the given environmental setting, supplemented by a little bit of symbiosis that is evolved due to the edibility and attractivity of some of its more rapidly evolving compounds. Starches, flavorants, aromatics and even colorants are now becoming important co-evolved attractants in plants, all of this evolved well before mankind became a piece of this chemical evolution puzzle. At this point it helps to reconsider the development of wood in plants. It was the development of large structural features that much of the synthesis pathways have until now been directed towards. These paths utilize large amounts of chemical synthesis and cytobiochemical energy pathways. The point of this process in a humanistic way of describing it was to become larger and more sturdy, and perhaps harder to forage, and when you have the chance produce some antifeedant chemicals as well. The main emphasis was to deal with size, and so terpenes were developed to resist easy loss in the organism downward due to gravity, and to assist in the temperature changes these plants had to endure over time. These plants obviously did not evolve under very hot conditions–the terpenes are too flammable and work against survival to an extent in cases where volcanoes and fires were every day, every place events. This is why the common premise is that this feature first evolved in the cold temperature settings, perhaps due to an ice age, and then later adapted to warmer climates and topographic settings. 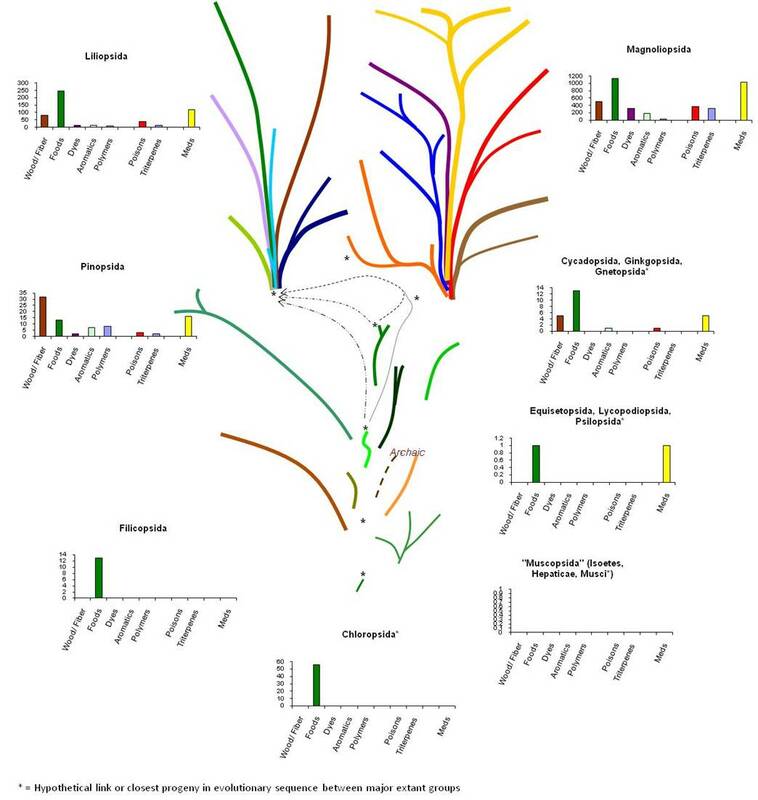 When the gymnosperms became neighbors of the newly evolved angiosperms, since it seems sensible to relate the earliest angiosperms to the gymnosperms, it has been a common though to link Angiosperms to the non-terpene rich Gnetum or one of its relatives. This plan basic woody stemmed plant does have some of the chemical structural feature we might expect to fin in early angiosperms. However, Angiosperms families do usually possess some complex chemistry and considerable woody structure development. This led early taxonomist to think that woody members were the more primitive examples of angiosperms, which is a logical conclusion. Takhitjan’s theory proposes that there were to roots of evolution that developed–woody and non-woody tracks, or lignose and herbaceous, which he termed Lignosae and Herbaceae. The fact that the later Rosidae that was defined bore both of these types of plants led taxonomist to think of this subclass (or its Superorder Rosiflorae) as a mixture of two genetic paths in evolution. This also might be the case. But it is difficult to break Rosidae into cleanly divided opposing chemical groups–such as phenolic tannins versus flavo-tannins, terpenoid vs. non-terpenoid, oligoterpenoids versus poly(tri+)terpenoid, neoligan versus non-neolignan, etc. taxonomic splitting features which do appear in higher subclasses and families. By placing the Woody orders into archaic groups–the paleodicots–we see this division in woody structure bearing and non-woody structure bearing plants more clearly. Pinidae, Magnoliidae, and Hamamelidae, all primarily lignose, are prime examples of this. Tannins features for each of these help to further support this possible indirect, but very primitive chemical relationship that may exist between these three large plant groups. Magnoliidae has its herbaceae as well though, what 1950s taxonomist called “Ranales”, which were the herbaceous members. For example the herbaceous Ranunculales had its lignosae equivalent the Berberidaceae-Berberidales proposed in this split Superorder (Magnoliflorae-lignose and herbaceae) scenario. With Magnoliidae and Hamaelidae so placed, this leaves us with Rosidae, Dilleniidae, Caryophyllidae, Asteridae (or the respective –florae for each). Rosidae/Rosiflorae is where the split occurs, with lignose going into some Rosidae subgroups and into the woody Dilleniidae members. The malingering lignosae in Caryophyllidae is Cactaceae. There are very few Asteridae which are very woody, with perhaps the Chilean Aster family members being the woodiest of this particular family. Likewise the Urticiflorae has its mixed lignose-herbaceae splits. The herbaceous Cruciferae has its woody relatives. Ther Hypericum its very close relative Garcinia. In termsof Lignose versus Herbaceous, there is no clear split in the taxonomic tree that can be formed. This is due to the lack of links between these different groups in the paleobotanical collections. Viewing this concept theoretically more as a chemical pathways phenomenon and less as a pure structure and structure form related feature, we come up with a clearer model of how to visualize these processes taking place over time. Plants start with moderate biological energy and produce a lot of more directed and effective pathways. Over time these pathways become able to develop large amounts of products and byproducts, thus enabling wood to be developed and evolution and natural selection taking over by enabling the plant to grow larger and taller due to this new chemistry. As time passes, the mechanics of this growth and methods of synthesis are perfect and very large plants developed which are fairly non-complex in their overall chemical routines. In Stage 2 of this process, the plant then begins to develop various new and alternative pathways, reducing its want and needs for the major physical structures, which are replaced by its chemical defenses. Now more bioenergy is going into toxin production and less into structural change and modification. Thus, plants get smaller because they learned to be more toxic, and diverse in that toxicity.